The Boys 16s final might have been considered the welterweight undercard before the heavyweight throwdown that was the Boys 18s final at the USTA National Championships in Kalamazoo this past August. The young men playing the on the final day in Kalamazoo – Alexandre Rotsaert and Patrick Kypson -- surely had it in their minds that one day soon they'll have the kind of success as the young men who followed them on center court – Stefan Kozlov and Frances Tiafoe – both of whom had won Grade A junior titles and reached the late stages of junior grand slams, not to mention ATP Challenger Finals. Most of the kids playing the 16s are between 14-16 years old. Some players will start playing the 18s well before they turn 17, if they’re advanced enough to hang with the generally bigger, stronger, and faster older guys. While the 18s winner, Frances Tiafoe, received a main draw wild card to the US Open men’s singles tournament, the 16s winner still gets a significant prize – a main draw wild card to the US Open boys’ singles tournament. But that person also gets a lifelong sense of pride in accomplishment as being the national champion. It’s telling that when I interviewed a number of current and recent college players for a “Memories of Zoos Past” video, several discussed playing the 16s with the same passion and intensity as they did playing the 18s. This was my second year in Kalamazoo. Having had relatively little experience watching junior tennis, I was excited last year to see the likes of recent junior Wimbledon champion Noah Rubin and finalist Stefan Kozlov. But upon watching them, I came away impressed by the ball-striking ability and relative power of 16s guys like John McNally, Sam Riffice and Connor Hance. This year, I wanted to learn more about what I was watching when I was watching the 16s. What were they working on, and what were the many, many college coaches looking for when they were scouting these potential future college players? She put that to playing in front of such a large crowd. “For 99% it's by far the most people they've ever played in front of. The only other example would be Le Petits As. Especially this year when all the 18s are pros, everybody's back here." For part 1 of this series, I talked to three college coaches, who were there scouting potential future players in both the 18s and the 16s tournaments. In part 2 Sunday, you will meet the players who made up this year’s Boys 16s semifinals. In part 3 on Monday, I will discuss what I learned from two top junior development coaches. How do you measure something like maturity? 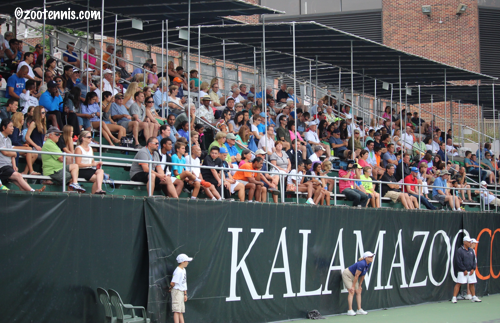 Kalamazoo is often the first time a lot of young players have played for such a large audience, and especially for such a large group of college coaches. Does that put any kind of pressure on them? Like Dancer and Martin, John Roddick, head coach at the University of Oklahoma, also played Kalamazoo, reaching the finals of the 16s singles in 1992 (losing to Paul Goldstein 6-4 in the 3rd) and the semis of the 18s singles in 1993. His brother, Andy, was the 16s finalist in 1998, losing to Alex Bogomolov, Jr. 6-3 in the 3rd. Older brother Roddick said that reaching the 16s final showed him that he had “a chance” to be a really good player. I asked about his brother, who went on to become the most successful American pro to emerge in the past 20 years. “I’d gone to college by that point. We just kind of knew the path. He was on track, he was getting better. I think at that time he was a little bit better player than I was at the same age, even though we had similar results. We kind of knew he had a chance as well. But even after that, he took a massive dip and had a big growth spurt where he had some injuries. There's just so much that goes into being a world-class player. Especially the second time around, we knew what to do and how to do things, and where we were. In Part 3 on Monday, I interview two top junior development coaches. I spoke with Zeke Clark about his decision to commit to the University of Illinois earlier this month at the ITF Pan American Closed in his hometown of Tulsa. Clark, who reached the semifinals at the Grade B1 tournament, is "the biggest fighter probably in junior tennis right now" according to Pan Am finalist JJ Wolf, so he a great many admirers among college coaches and therefore many options. In this announcement at the Tennis Recruiting Network, Clark relates why Illinois was perfect for him. There are a lot of college sports out there that have a higher profile than tennis but you'd be hard-pressed to find one that is more exciting. Many that follow the sport got hooked after seeing a dual-match live and in person but the issue is how do you get people to show up that first time? 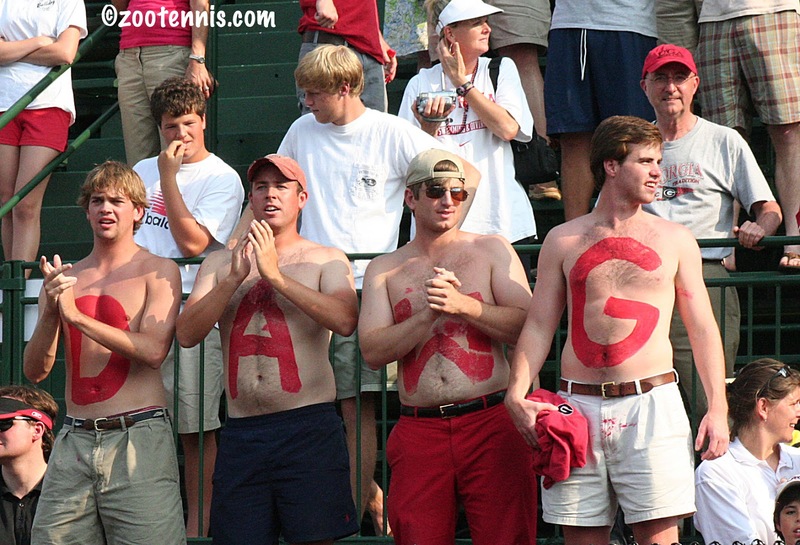 As a long time follower of college tennis there are a number of things that I think each school should be doing to help grow its following and raise its profile on campus. There are also a number of things that I think the ITA/USTA/NCAA can do on a national scale to help grow college tennis and lastly, the general public can play a role too. Let's start off at the local level and look at what each school should be doing to increase its following both in person and online (some are already doing many of these). 2. Be extremely active on social media to get the message out about match times, promotions, results, etc. 3. Run features on each student-athlete during the fall so everyone can get to know who these guys/gals are and where they are from. Here is a nice piece that Florida did on Josie Kuhlman and Arizona did one on Oliver Plaskett. After watching these it gives you a better sense of who they are and makes you want to follow them to see how they do - it's also interesting to hear how they got to where they are now. Run an in-match blog (Baylor, Tennessee, Ole Miss, Georgia) through Cover It Live or even through a google doc. If the resources aren't there to do a blog make sure you have someone running the team's twitter account during the match to interact with fans and provide updates - Princeton, Harvard, and several of the Ivy League schools do a really nice job on twitter. Have an easy to read and accurate online scoreboard (no one likes to see the score jump all over the place). Of course if the online scoreboard is automatically tied in to the hand held devices that the chair umpires have then there's really nothing to do. Have a way to communicate the score during a tiebreak - there are a lot of schools that use the same scoreboard which doesn't have the capability to show a tiebreak score. There's nothing worse than following the match online and waiting and waiting to see the 6-6 set-score change to 7-6. If your live scoring program won't permit it then have someone tweeting the score out after each point or at least every other point. Provide streaming video if the funds/bandwidth/conference permit it; if they do then do it right - HD stream with sound and on-screen scoring. Stanford is the gold standard in streaming/scoreboards in my opinion. If streaming is not possible then have video clips posted during the match of some of the bigger points that provide momentum swings i.e game, break, and match points. 5. Start matches at the published times - so if the schedule says 1pm on Sunday then at 1 pm the first point of doubles should be underway. The pre-match festivities including the doubles warmups should take place within 15 minutes prior to the start. The big push for no-ad seems to be centered around the length of the matches so why waste 10 minutes of time before the match even begins? 6. Schedule Monday through Friday dual-matches in the 5pm to 9pm window to maximize the number of people that can attend. If you look at the ITA's Attendance Leaderboard all the schools in the top 10 are scheduling wisely. 7. Two words - Beer Garden. Now I know that many schools aren't interested in offering this but there's a growing number of schools that are selling adult beverages at football games and other sporting events and I expect this trend to continue in years to come. This would be an additional source of revenue though it obviously would have to be handled in a responsible manner. 8. Have a post-match online recap that at the very least includes quotes from the coach. If you can include a video clip of a match point or a post-match interview that's an added bonus. The more details about the match the better - if someone came back from 6-1, 5-1 down to win in 3 sets I'd like to know that he/she made a tremendous comeback as opposed to just having the final score listed without the details. If you want to see how a recap is done check out one of Duke's (ex. Duke/Stanford from NCAA 2nd Round) - absolutely phenomenal work that every school should try to emulate. There are some schools that do the absolute bare minimum on each recap and I'm hoping that's because no one ever showed them what a real recap looks like. 9. Try to get a few members of the pep band out for at least one big match a year - it's always cool to see some schools (USC/Virginia) bring the pep band out for the NCAA Championship match and it creates a good atmosphere in between the singles and doubles point. 10. Have an alumni page that tracks what guys are up to after they leave college. Virginia and Tennessee both have really nice pages that track former players on the tour. 11. Have a Tennis Booster Club set up so alumni/fans/parents can contribute financially to help support and grow the program. 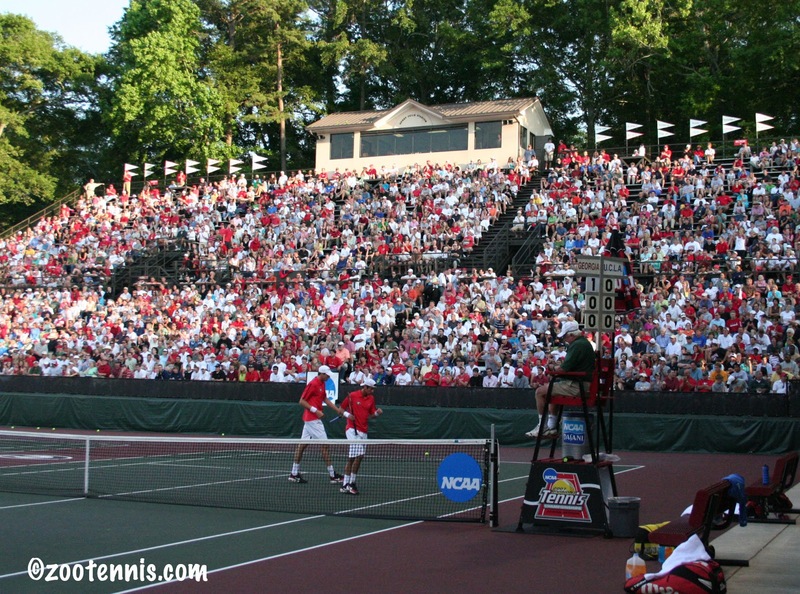 Georgia, Virginia, Baylor, Ohio State, Illinois, Minnesota, and New Mexico are a few examples of programs that have a way of giving directly to the tennis team. Put together your wish-list of what you'd like to have along with the associated costs so donations can be earmarked for whichever project that people see fit. Remember if you don't ask for help you're not going to get it!! 1. Get as many matches on television/streamed online as possible because the more accessible the sport the bigger the potential following. A bigger audience potentially equals more sponsors and sources of revenue. It sounds like no-ad scoring is here to stay so that will keep most matches within the 3-hour time window that is important for TV. 2. 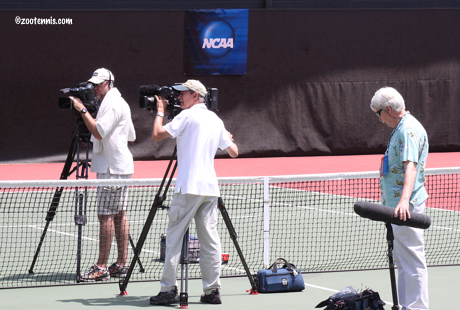 Find a way to get the NCAA Championships on the Tennis Channel, ESPNU, or Fox Sports. 3. 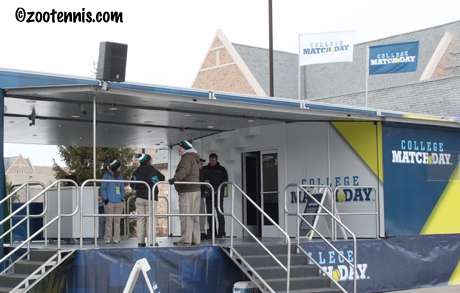 Expand the USTA MatchDay concept (which was a big deal 2 years ago but not last year) to have a College GameDay feel to it. 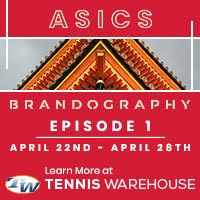 Bring some knowledgeable college tennis people in to talk about the weekend slate of matches with the show being on-campus at a big-time match. Of course to do this you'd need a television partner to broadcast it. 4. Have a section on the ITA's website that has draws/results of all the fall tournaments because as it is now it's tough to follow many of the non-major tournaments because there's no way to find the information. 5. Have a page on the ITA's site that lets you filter schedules/results by conference/ranking along with starting times and live scoring/video links. The results page currently in place is good but if it could be filtered to include the other data it'd be great and would be a really useful resource. 6. 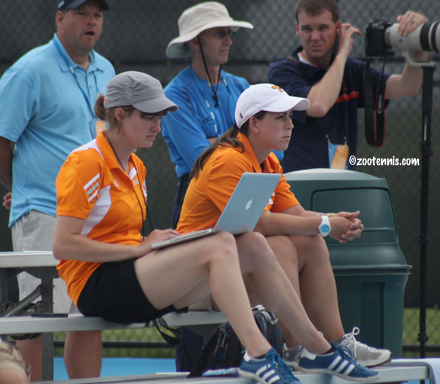 Attempt to get all schools set up on the same live scoring program so all the data could be aggregated into one official college tennis scoreboard. How cool would it be have a page where you could track multiple dual-matches at once - if done right it's a service that I believe many would be willing to pay for especially if you could roll in streaming video. 7. Play all matches to their conclusion unless it's during tournament play - then and only then is the clinch rule necessary. It doesn't make sense to have family and friends come to watch their son/daughter/friend play a match that gets stopped just as it's nearing the finish line. If time is that big an issue then play a 10- point tiebreak in lieu of a third set. 8. Be transparent about changes - if you say that going no-ad is best for the student-athlete then show the data that supports it. If the data does support the change then you'll see the resistance strongly decreased. Of course if the data doesn't support the change then you've got another problem. 9. Keep adding sponsors - getting Oracle on board as the sponsor of the rankings and the Oracle Masters was a big feather in the cap for the ITA and college tennis. 3. If your school does an in-match blog or provides live updates on twitter then make sure you let the blogger and/or tweeter know that you appreciate their efforts and don't be afraid to engage in the conversation. The schools that run in-match blogs have the data to show how many people get on the blog and if the numbers aren't there to justify it then it'll go away. 4. If your school isn't doing an adequate job keeping its fans informed then make your voice heard by emailing the tennis Sports Information Director (SID) and/or Head Coach. If they don't hear from anyone then they might not think there's a need to have an online scoreboard, twitter feed, blog, etc. 5. If you have the financial means, make a contribution to the tennis program to help them with supplies and extras that aren't covered under the budget. The collegiate sports world is a constantly changing landscape and in this day in age it's all about what have you done for me lately. 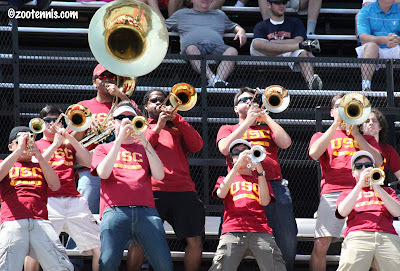 The key to keeping college tennis on an upward trajectory is to always be proactive. If you are a tennis coach/administrator, you should always be thinking about what can I do to get an extra 10 people to show up at each match. If you are involved with the ITA/USTA/NCAA, you should be focused on making college tennis more accessible to the masses through television and streaming video (if no-ad scoring can make that happen then ok). If you are a fan, attend as many matches as you can and keep spreading the word that college tennis is an exciting sport that is action-packed from start to finish. If college tennis wasn't a great sport there wouldn't be big-time donors pumping in millions of dollars to build some of these luxurious stadiums that we've seen pop up in Waco, Dallas, and Stillwater over the last several years. Let's just hope that 5-10 years from now college tennis's popularity is on the rise and we're watching multiple matches on television every week. Tennis always struggles with the "How can I miss you if you never leave?" problem, with such a short offseason. Junior tennis has an even shorter (or virtually nonexistent) offseason, and in a few weeks, I'll be embarking on my late-November and December trek to Florida for the Eddie Herr, Orange Bowl and Junior Orange Bowl tournaments. 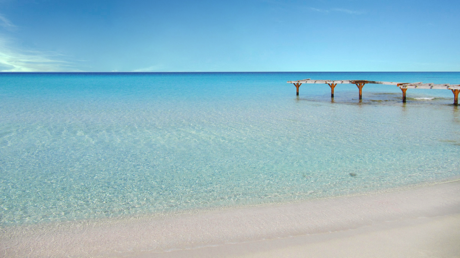 But after more than ten years of not taking more than a few days off during the year, I'm going on a real vacation, one which does not involve tennis. I am taking my computer and my phone, but I plan on a break from my usual daily routine of monitoring results and watching live scoring/streams (or, of course, covering a tournament onsite), so I won't be posting on Zootennis. That doesn't mean Zootennis will go dark however. Bobby Knight of College Tennis Today has a post coming here on Wednesday, providing his suggestions on how college tennis can raise its profile and popularity, with athletic departments, the ITA/USTA/NCAA and fans all having roles to play. 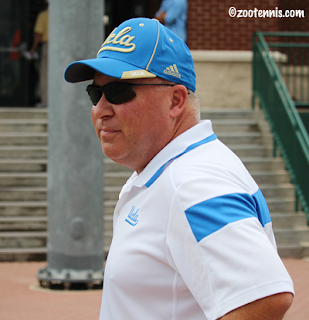 On Friday, I will have a link to my Tennis Recruiting Network article on blue chip Zeke Clark's commitment. 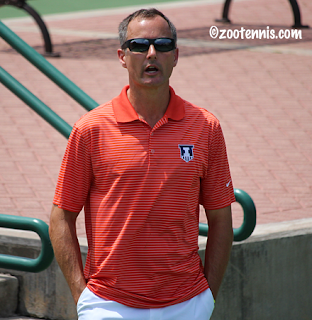 And Jonathan Kelley of On The Rise Tennis will have a three-part post on the Kalamazoo 16s, with thoughts from college coaches, the four 2015 semifinalists, and two junior development coaches, beginning on Saturday. Bobby and Jonathan are two dedicated and passionate members of the tennis media who have contributed much to my knowledge and appreciation of the game in the past several years, and I'm delighted they took the time to contribute to Zootennis.com. Bobby is in the midst of the final few days of the Division I Regionals, so please check his site for all the latest on the winners, and who will be competing in the USTA/ITA National Indoor Intercollegiate Championships in New York next month. I'll be back to my regular daily posting schedule next Tuesday. Grace Min won her first title in more than year today at the $25,000 Women's Pro Circuit event in Florence, SC. The 21-year-old from Georgia, who has had a difficult year, took a tough 6-2, 4-6, 7-6(2) decision from unseeded Paula Goncalves of Brazil in today's final. No. 3 seed Min, who broke into the WTA Top 100 back in March, has seen her ranking plunge into the 200s, so winning any tournament, particularly in a third-set tiebreaker, has to be satisfying for her. Min, the 2011 US Open girls champion, will attempt to build on today's title at the $50,000 event in Macon, Georgia, which is the first of the three USTA Pro Circuit tournaments that make up the Australian Open wild card challenge. The second round of qualifying on Monday finds nine Americans in action: juniors Ingrid Need and Michaela Gordon, Cal junior Maegan Manasse, recent Georgia graduate Lauren Herring and Jacqueline Cako, Chiara Scholl, Vania King, Jan Abaza and Lindsay Lee-Waters. The men's Australian Open wild card challenge doesn't begin until next week in Charlottesville, Virginia, with this week's North American ATP Challenger taking place in Monterrey, Mexico. The $100,000 + hospitality tournament's qualifying featured only 16 players, and just one American, Nikita Kryvonos, and he did not qualify. 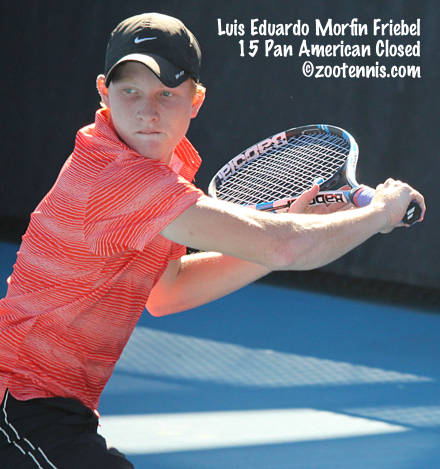 One surprising qualifier was 17-year-old Luis Eduardo Morfin Friebel of Mexico, who played the ITF Grade B1 Pan American Closed last week and lost in the second round to Kyrylo Tsygura. The main draw will have no American qualifiers, but plenty of Americans. Taylor Fritz received a wild card, his second in the past four weeks (he received special exemptions into the Fairfield and Las Vegas Challengers). He will play No. 4 seed Bjorn Fratangelo. Other seeded Americans are Dennis Novikov(6) and Austin Krajicek (3). Deiton Baughman, Ernesto Escobedo, Mitchell Kreuger, Adam El Mihdawy, Dennis Nevolo, Kevin King and Chase Buchanan give the USA 11 of the 32 players in the draw. Las Vegas champion Thiemo de Bakker of the Netherlands is the No. 5 seed this week in Monterrey, which has three ATP Top 100 players: No. 64 Victor Estrella Burgos of the Dominican Republic, No. 71 Paolo Lorenzi of Italy and Krajicek, ranked 96th. A second straight $50,000 women's tournament takes place in Canada, this time in Toronto, with seven Americans in the main draw: Melanie Oudin, Caitlin Whoriskey, Danielle Lao, Samantha Crawford(4), Maria Sanchez(6), Kristie Ahn(8) and Jessica Pegula(2). Three juniors received wild cards: Canadians Charlotte Robillard-Millette and Bianca Andreescu and Fanni Stollar of Hungary. In ATP finals today, both Jack Sock and Steve Johnson failed to take titles. Sock, the No. 7 seed, lost in Stockholm to top seed Tomas Berdych of the Czech Republic 7-6(1), 6-2. Sock did get a title however, taking the doubles with Nick Monroe. Sock and Monroe beat New Zealand's Michael Venus(LSU) and Mate Pavic of Croatia 7-5, 6-2. In the ATP article on the final, Sock reveals that he is going to play fewer doubles events next year. Johnson held tough against David Ferrer of Spain until the last two games of his 4-6, 6-4, 7-5 loss to the top seed in Vienna. Johnson, playing in his first ATP final, will need to make it to 50 more to match the total of the 33-year-old Ferrer, who is ranked No. 8 and likely earned a trip to the World Tour Finals in London next month with his win today. Also of note, 18-year-old Russian Andrey Rublev, 2014 ITF World Junior Champion, won his first ATP title in Moscow, in doubles. He and Dmitry Tursunov of Russia, who were a wild card entry, defeated unseeded Radu Albot of Moldova and Frantisek Cermak of the Czech Republic 2-6, 6-1, 10-6. 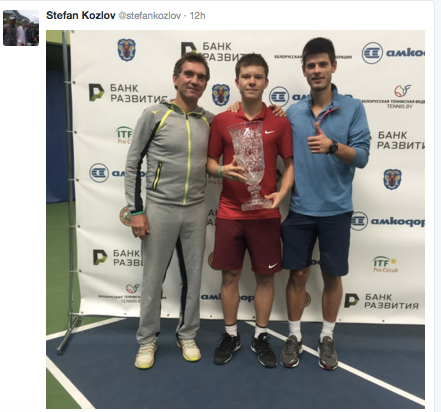 Stefan Kozlov claimed his first professional singles title today in the $15,000 Belarus Futures, defeating No. 2 seed Dzmitry Zhyrmont, who beat him in last week's final, 6-1, 7-6(1). The 17-year-old, the No. 5 seed in both this week's and last week's Futures tournaments in Belarus, had reached the final of the $100,000 Sacramento Challenger last year, so when those points dropped off, his ATP ranking fell from the mid-400s to the mid-500s. But with his results these past two weeks, he will move closer to his career high of 354, reached this summer. Grace Min is the only American in the singles finals of the three North American pro tournaments this week. Min, the No. 3 seed, beat unseeded Robin Anderson 6-3, 6-3 in the semifinals of the Florence, SC $25,000 tournament and will play unseeded Paula Goncalves of Brazil in Sunday's final. Keri Wong (Clemson) and Bosnia's Ema Burgic Bucko(Baylor) won the doubles title over Diana Marcinkevica of Latvia and Chiara Scholl, 7-6(6), 6-1. Burgic Bucko and Wong, who, like Marcinkevica and Scholl, were unseeded, did not drop a set in their four wins this week. At the $50,000 ATP Challenger in Las Vegas, No. 8 seed Dennis Novikov lost a tough one to Grega Zemlja of Slovenia 6-4, 2-6, 7-6(5). Zemlja hit 12 aces and no double faults, while Novikov had 13 aces, but 7 double faults. At 5-5 in the final set tiebreaker, Novikov missed a forehand just long during a rally to give Zemlja a match point, which the 29-year-old converted when Novikov again missed a forehand, although it was a more aggressive attempt than his previous error. The unseeded Zemlja will play No. 7 seed Thiemo de Bakker of the Netherlands in Sunday's final. In the semifinals of the $50,000 women's tournament in Saguenay, Canada, Americans Maria Sanchez and Nadja Gilchrist both lost today. Sanchez, the No. 6 seed, fell to unseeded Amra Sadikovic of Switzerland 1-6, 7-6(1), 6-1, while qualifier Gilchrist lost to unseeded Jovana Jaksic of Serbia 7-5, 7-5. Sanchez also lost in the doubles final. She and partner Sharon Fichman of Canada, the top seeds, were beaten by unseeded Mihaela Buznarescu of Romania and Justyna Jegiolka of Poland 7-6(6), 4-6, 10-7. Better news for Americans in the ATP events in Europe, with both Jack Sock and Steve Johnson reaching finals. No. 7 seed Sock breezed past No. 2 seed Richard Gasquet of France 6-4, 6-2 and will play top seed and defending champion Tomas Berdych of the Czech Republic in Sunday's final in Stockholm. Sock will also contest the doubles final in the ATP 250-level event, with partner Nick Monroe. Johnson reached the first ATP final of his career at the ATP 500 tournament in Vienna, defeating Ernests Gulbis of Latvia 6-3, 7-6(4) in the semifinals. He will play top seed David Ferrer of Spain in Sunday's final. After a week off after the Pan American Closed, the fall ITF Junior Circuit in the US resumes at the Grade 4 in Atlanta. Two rounds of qualifying were completed today, with the matchups for the final round of qualifying Sunday available under the Results tab here. After a break yesterday to wrap up the ITF Grade B1 Pan American Closed, it's back to the Pro Circuit, with four former college players advancing to the semifinals in North American tournaments. But before I get to their results today, I realize I've neglected Stefan Kozlov's recent success in European Futures. The 17-year-old Floridian went to Europe at the end of September, unlike his peers, who have all stayed in the US to compete in Futures and Challengers here. Last week at a $15,000 tournament in Belarus, Kozlov, the No. 5 seed, reached the final, losing to 26-year-old Dzmitry Zhyrmont of Belarus, the No. 3 seed, 6-1, 6-4. Tomorrow Kozlov(5) and Zhyrmont(2) will meet again in another $15,000 Futures final in Belarus, with Kozlov in search of his first career Futures title. 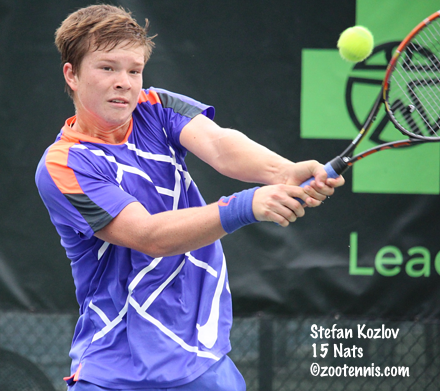 Kozlov will be the only US teenager in a men's final this weekend, after Taylor Fritz lost in the second round on Thursday to unseeded Grega Zemlja of Slovenia at the $50,000 Las Vegas Challenger 6-7(6), 6-2, 6-2 and wild card Michael Mmoh was defeated in the quarterfinals today by No. 7 seed Thiemo de Bakker of the Netherlands 6-1, 6-3. Mmoh never saw a break point against de Bakker, and Mmoh's six double faults didn't help his cause. But with his first two wins at the Challenger level this week and coming off his title at the $15,000 Houston Futures last week, Mmoh has every reason to be positive about his performance in October. Jared Donaldson, the No. 6 seed, also lost today, falling to unseeded Blaz Kavcic of Slovenia 3-6, 7-5, 6-1. The only American to reach the semifinals is 21-year-old Dennis Novikov, the No. 8 seed, who defeated top seed Austin Krajicek 7-6(2), 3-6, 7-6(3) in a battle of former Kalamazoo 18s champions. Novikov won the previous two non-USTA Pro Circuit Challengers this fall in Cary, NC and Columbus, OH, so he is going for the triple crown this week. Novikov will play Zemlja in Saturday's semifinals. At the $50,000 women's tournament in Saguenay, Canada, former USC All-American Maria Sanchez reached the semifinals, defeating 16-year-old Canadian wild card Charlotte Robillard-Millette 7-5, 6-0. Sanchez will play unseeded Amra Sadikovic of Switzerland in the semifinals, after Sadikovic defeated Stanford junior Carol Zhao 6-4, 6-4 in the quarterfinals this evening. Former Georgia All-American Nadja Gilchrist, who qualified in Saguenay, is into her first $50,000-level semifinal after defeating Ashley Weinhold, also a qualifier, 3-6, 7-6(3), 6-3. Gilchrist will play unseed Jovana Jaksic of Serbia, who downed No. 5 seed Samantha Crawford 7-6(0), 6-3. At the $25,000 women's tournament in Florence, SC, the 2015 ITA Player of the Year Robin Anderson has reached the semifinals, defeating qualifier Sonya Kenin 6-2, 6-1. Kenin may have been drained from her 2-6, 6-2, 7-6(7) win over fellow teen qualifier Sophie Chang, with Kenin coming back from 6-1 down in the final set tiebreaker to steal the victory. Anderson will play No. 3 seed Grace Min in the semifinals. Min defeated French qualifier Elixane Lechemia, a former standout at South Carolina, 1-6, 7-5, 6-2 to advance. Duke freshman Kaitlyn McCarthy had a great run through the qualifying and into the quarterfinals, where she was beaten today by one of the only two seeds remaining, No. 6 Florencia Molinero of Argentina, 4-6, 6-4, 6-2. Jack Sock and Steve Johnson have reached the semifinals of ATP events in Stockholm and Vienna with big wins today. Sock, the No. 7 seed, defeated No. 3 seed Gilles Simon of France 7-5, 7-6(5), coming back from a 5-2, two-break deficit in the second set in the ATP 250-level tournament. He will play No. 2 seed Richard Gasquet of France in Saturday's semifinals. Sock is also in the doubles semifinals, with former North Carolina Tar Heel Nick Monroe. Johnson, who is unseeded, beat No. 2 seed Kevin Anderson 5-7, 7-6(5), 6-4, putting an end to his four-match losing streak against the former Illinois star. Johnson will play unseeded Ernests Gulbis of Latvia in the semifinals of the ATP 500 tournament. My recap of last week's ITF Grade B1 Pan American Closed Championships is available today at the Tennis Recruiting Network. The photo gallery is available for mobile devices here. Because I am able to get the proper perspective at the Tulsa courts, I can film both players at the same time. That means I could do just one video compilation for the boys final and another for the girls final. I didn't realize until I processed the boys video just how spectacular many of the points were in the Brandon Holt-JJ Wolf match, which accounts for the length of the video. Up until 2014, the USTA distributed its reciprocal Australian Open wild card at invitational tournament in Atlanta, usually in December. Although that tournament was popular with local fans, the fact that only eight men and eight women were able to compete for the wild card was a drawback. So last year the wild card was decided by point totals in Pro Circuit Challengers, as the reciprocal French Open wild card and one of the eight US Open wild cards have been decided since 2012. The Challengers deciding this year's Australian Open wild card are all $50,000 events. For the men, the tournaments are the same three events as last year: Charlottesville, Knoxville and Champaign, the weeks of November 2, November 9 and November 16. The women will start in Macon next week, as they did last year, but the next two tournaments on the schedule are in new locations. 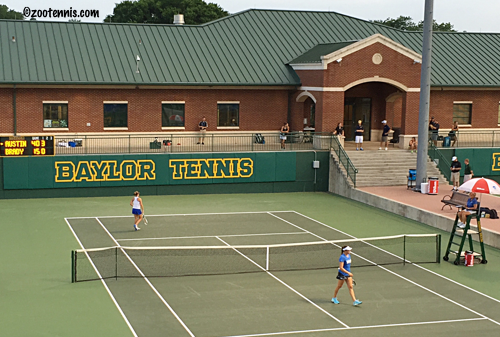 Baylor's Hurd Tennis Center will host the tournament in Waco the week of November 2nd, and the Wild Card Challenge will conclude the following week, one week before the men, in Scottsdale, Arizona. As has been the case throughout these Challenges, the best two results in the three tournaments will decide the winner. Last year's winners Irina Falconi and Denis Kudla have moved their WTA and ATP rankings into the 60s now, so they will not be participating. In the non-USTA Pro Circuit Challenger in Las Vegas today, No. 6 seed Jared Donaldson outlasted qualifier Eric Quigley 6-2, 2-6, 7-6(4) to reach the quarterfinals of the $50,000 event, where he'll play Blaz Kavcic of Slovenia, who took out No. 2 seed Tim Smyczek 7-6(5), 6-4. Top seed Austin Krajicek beat Marek Michalicka of the Czech Republic 7-5, 7-5 and the 2008 Kalamazoo 18s champion will play 2012 Kalamazoo 18s champion Dennis Novikov, the No. 8 seed in Friday's quarterfinals. Novikov defeated Dan Evans of Great Britain 6-4, 7-6(2). Taylor Fritz, Michael Mmoh and Frances Tiafoe, the three 17-year-old Americans, are in action on Thursday. There is live streaming of the event, but this week the excellent Mike Cation is not doing commentary, and I don't believe anyone else is stepping in from the matches I've streamed. Usue Arconada has reached the quarterfinals of the $25,000+H ITF Women's Pro Circuit event in Colombia with a win over No. 3 seed Andrea Gamiz of Venezuela. She defeated Gamiz, who reached the final of the $25,000 Rock Hill SC tournament last week, 6-2, 7-6(5). Arconada, currently 481 in the WTA rankings, plays unseeded Maria-Fernanda Alvarez-Teran of Bolivia next. No. 7 seed Lauren Albanese also has advanced to the quarterfinals. At the $50,000 ITF Women's Circuit event in Saguenay, Canada, Stanford junior Carol Zhao, ranked No. 1 in the preseason collegiate rankings, has advanced to the quarterfinals, beating No. 7 seed and recent two-time USTA Pro Circuit champion Michaella Krajicek of the Netherlands 1-6, 7-6(1), 7-6(4). She will play unseeded Amra Sadikovic of Switzerland next. Sixteen-year-old wild card Charlotte Robillard-Millette of Canada advanced to the second round with a 6-3, 6-4 win over Ellie Halbauer. At the $25,000 women's tournament in Florence, only first round matches were played today, with qualifiers Kaitlyn McCarthy, Sophie Chang and Sonya Kenin moving into Thursday's second round, along with Robin Anderson and No. 3 seed Grace Min. And because I suspect I will not have room to feature them in the upcoming aces, congratulations to Lloyd Glasspool (Texas '15), who won his first Pro Circuit singles title last week in Greece and took the doubles title, his third, as well; Tom Jomby (Kentucky '14) getting his third Futures singles title, in Israel; and Saketh Myeni (Alabama '10) claiming his second Challenger title, this one in Vietnam. Those who believed this year's Kalamazoo 18s field was among the best ever received additional validation today at the $50,000 Las Vegas Challenger, with 17-year-olds Taylor Fritz (Kalamazoo semifinalist), Michael Mmoh(Kalamazoo quarterfinalist) and Frances Tiafoe (Kalamazoo champion) all posting first round wins. Mmoh, who won the $15,000 Houston Futures last week, received a wild card and maximized his opportunity, beating No. 3 seed Ryan Harrison 6-2, 6-3 for his first Challenger-level win. Harrison, at 104, is the highest-ranked player Mmoh has beaten. Mmoh will face 32-year-old Giovanni Lapentti of Ecuador in the second round. Interesting that Mmoh was able to retain his No. 2 ITF Junior ranking even though he didn't defend his two titles at last week's ITF Grade B1 Pan American Closed in Tulsa. The ITF's No. 1 junior, Taylor Fritz, continued his impressive run, hitting 13 aces in his 6-3, 6-2 win over Nicolas Barrientos of Colombia. Fritz, who now has a 17-match winning streak, has gotten a special exemption into both last week's Fairfield Challenger and this week's Challenger in Las Vegas. He will play unseeded Grega Zemlja of Slovenia, who prevented a third straight Dustin Brown-Fritz match by defeating the fourth-seeded German 7-5(5), 1-6, 6-3. Fritz spoke with the ATP's Josh Meiseles about the change in his schedule now that he's winning Challengers and what it means to be among such a successful group of young Americans. Tiafoe, in the draw on his own ranking, had the most difficulty advancing to the second round, defeating qualifier Dennis Nevolo, the former Illinois All-American, 6-2, 4-6, 7-6(6). He will next play No. 5 seed Blaz Rola of Slovenia, who beat Tiafoe in the first round of the Tiburon Challenger late last month. The top seed, former Texas A&M All-American Austin Krajicek, advanced to the second round with a win today, as did qualifier Eric Quigley, the 2012 NCAA singles finalist from Kentucky. Jared Donaldson(6), Dennis Novikov(8) and Tim Smyczek(2) won their opening round matches yesterday. The lone USTA Pro Circuit event this week (Las Vegas is not one) is the women's $25,000 event Florence, South Carolina, where qualifying was completed today. Sonya Kenin, the USTA National 18s champion and US Open girls finalist, was initially listed as receiving a wild card into the main draw, but for whatever reason, she played qualifying instead and won her three matches. The final one today was against fellow 16-year-old Michaela Gordon, and for the third time in four meetings, Kenin prevailed, beating Gordon 6-4, 6-3. Other Americans qualifying are Chiara Scholl, Virginia recruit Sophie Chang and Duke freshman Kaitlyn McCarthy. Kenin will play Ulrikke Eikeri of Norway on Wednesday. Julia Glushko of Israel is the top seed. Although the prize money is twice as much, the ITF Women's Circuit event in Saguenay, Canada had a similar ranking cutoff to that of Florence. Only four qualifiers make the main draw however, with Fanni Stollar of Hungary, Mari Osaka of Japan, Ashley Weinhold and Nadja Gilchrist(University of Georgia0 advancing. 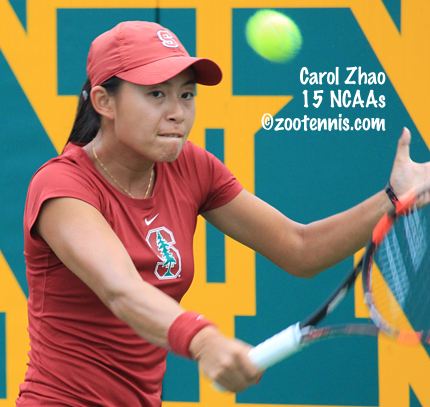 Stollar, Weinhold and Gilchrist all won their first round matches, as did Stanford junior Carol Zhao of Canada. The 16-year-old Stollar was drawn to face top seed Romina Oprandi of Switzerland, but Oprandi withdrew, so Stollar played lucky loser Karman Thandi of India, who is just 17, winning in three sets. Gilchrist defeated No. 8 seed Kristie Ahn and Weinhold beat Marie Benoit of Belgium. No. 2 seed Jessica Pegula and No. 5 seed Samantha Crawford also advanced to the second round, with Pegula beating Antonia Lottner of Germany 6-4, 6-4 and Crawford defeating Melanie Oudin 6-1, 6-4. In first round matches on Wednesday, 18-year-old Ellie Halbauer will face 16-year-old Canadian wild card Charlotte Robillard-Millette. No. 6 seed Maria Sanchez(Southern Cal) is also on Wednesday's schedule. At the $25,000 + hospitality ITF Women's Circuit event in Colombia, which didn't even require a WTA ranking to get into the qualifying, Usue Arconada advanced to the second round with a 6-1, 6-3 win over Alexandra Riley. She will play No. 3 seed Andrea Gamiz of Venezuela, who reached the final of last week's $25,000 tournament in Rock Hill, South Carolina. Lauren Albanese (7) and former Alabama All-American Alexa Guarachi (6), now playing for Chile, also advanced to the second round. 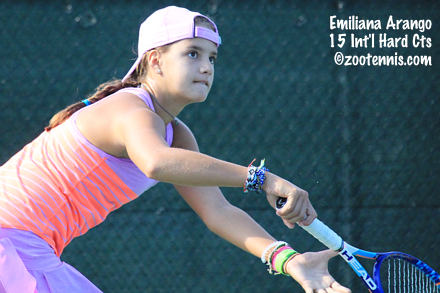 Fourteen-year-old wild card Emiliana Arango of Colombia picked up her first win on the ITF Women's Pro Circuit, beating qualifier Flavia Guimaraes Bueno of Brazil 6-4, 6-1. Nineteen-year-old Barbara Haas of Austria is the top seed. The National Small College Individual Championships were completed over the weekend in Sumter, South Carolina, with players from Division II, Division III, NAIA and Junior Colleges competing for individual titles in singles and doubles. The tournament culminates in the the Small College Super Bowl, where the four winners of each division play off with a place in next month's USTA/ITA National Indoor Intercollegiate Championships in New York at stake. The names of several of the Super Bowl winners may be familiar to those who follow junior tennis closely. Alejandra Cisneros of Mexico, a sophomore at Division II Armstrong State, was a Top 20 ITF junior just two years ago. The top seed in the Division II singles draw, Cisneros came from behind to beat No. 2 seed Natalia Siedliska of Saint Leo 0-6. 6-3, 6-4 to win the title and a place in the Super Bowl. There she cruised by Division III champion Eudice Chong of Wesleyan 6-1, 6-2 and had a similarly easy time in the final, beating Macarena Olivares, the Junior College champion from ASA Miami, 6-0, 6-2. Olivares had beaten NAIA champion Valeria Podda of Georgia Gwinett in the semifinals, and in the final of the Junior College championships, Olivares defeated Tyler Community College freshman Gabby Andrews, the two-time junior slam doubles champion, who initially committed to UCLA, but could not attend there due to issues with credits from her online schooling. The women's Super Bowl doubles title went to Division II Lynn's Rosalie Willig and Diana Bogolii, who defeated Olivares and her partner Megane Bianco of ASA Miami 6-3, 6-3 in the final. For more on Cisneros win, see the Armstrong State athletic website. Lynn's website has more on Willig's and Bogolii's victory. The women's Super Bowl draw is here. In the men's Super Bowl, Kevin Konfederak of NAIA Georgia Gwinett won both the singles and doubles titles. Argentina's Konfederak, also a top 20 ITF junior, but back in 2009, defeated Jan Meyer of Azusa Pacific, the Division II champion, 6-2, 6-2 in the final. Meyer had beaten surprise Division III champion Noah Farrell of Middlebury in the semifinals, while Konfederak downed Junior College champion Ferran Calvo of Tyler Community College. Konfederak had beaten teammate Jordan Cox in the NAIA Division final, but Cox, the 2008 Kalamazoo 16s champion and 2009 Wimbledon boys finalist, will still get his trip to New York after winning the doubles title with Konfederak. The pair defeated Division II champions Jui Mao and Ofir Gina of Concordia(NY) 6-4, 6-2 in the final. For more on the two Georgia Gwinett men's Super Bowl titles, see this article from their website. The men's Super Bowl draw is here. For links to all the small college draws, see the ITA tournament page. The Division I regionals, which will decide 12 more entrants to the Indoor Championships, began last week, with several completed today. 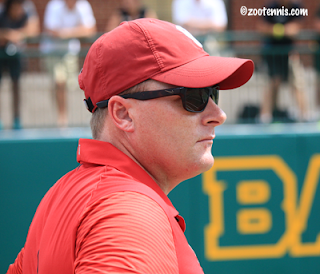 Bobby Knight at College Tennis Today is keeping close tabs on the men's regionals, and has provided a look and both the men's and women's entrants to date here. Below are the results of the women's regional finals so far, with the remainder scheduled for this coming weekend. Kelsey Laurente/Maria Alvarez, Oklahoma State def. Shannon Hudson/Yuliya Lysa, Arkansas 6-3, 7-5. Andie Daniell/Erin Routliffe, Alabama def. Skylar Kuykendall/Abby Owens LSU 6-4, 7-5. The ITA's Regional results page is here. Because I was in Tulsa for the Pan American Closed, I wasn't able to follow the USTA Pro Circuit events as closely as I would have liked. I did have an opportunity today to watch the live stream of the $50,000 Fairfield Challenger final in California, however, with Taylor Fritz winning his second straight Challenger title over Dustin Brown of Germany 6-3, 6-4. Brown and Fritz had met in the second round of last week's Sacramento Challenger, with Fritz saving three match points in his 6-7(3), 7-6(5), 7-6(7) win. The rematch in today's final was much anticipated, but Fritz was in control throughout, saving the only three break points he faced. When the 6-foot-4 right-hander, who turns 18 in ten days, gets 67 percent of his first serves in, as he did today, he will be difficult to beat, even by someone with as much game as the flashy Brown, who was the No. 3 seed. In all Fritz beat four seeds, including No. 1 Tim Smyczek, with all his victories in straight sets. According to the ATP's Josh Meiseles, Fritz becomes only the seventh active player to win multiple Challengers at age 17, joining Richard Gasquet, Juan Martin del Potro, Tomas Berdych, Rafael Nadal and Bernard Tomic. His ATP ranking will move into the 230s, and his winning streak, including the US Open Juniors, is now at 16. Frances Tiafoe also had a good week in Fairfield, reaching the semifinals before falling in three sets to Brown. 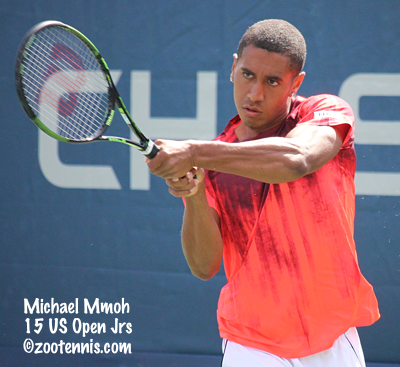 Another 17-year-old American, Michael Mmoh, won the $15,000 Houston Futures today, defeating Lucas Gomez of Mexico 6-3, 6-2. Mmoh, the No. 5 seed, beat top seed Eric Quigley and No. 3 seed Deiton Baughman en route to his third Futures final. Up 5-0 in the first set, and 4-1 in the second against the unseeded Gomez, Mmoh needed just over an hour to take his third Futures title and the second this year. His ranking will rise very close to the Top 400 when the points are added. Baughman won the doubles title in Houston, with Hans Hach(Abilene Christian) of Mexico. The top seeds defeated current Rice teammates Adam Gustavsson of Sweden and David Warren 6-2, 6-0 in the final. Jennifer Brady, the 20-year-old who left UCLA for professional tennis this summer, won her second $25,000 title, this one in Rock Hill, South Carolina. Brady, the No. 6 seed, did not lose a set all week, beating top seed Romina Oprandi of Switzerland in the semifinals and unseeded Andrea Gamiz of Venezuela 7-5, 6-4 in the final. When the points are added, Brady should return to the WTA Top 200. The doubles title went to Ema Burgic Bucko (Baylor) of Bosnia and Renata Zarazua of Mexico. The unseeded team defeated top seeds Elitsa Kostova of Bulgaria and Florencia Molinero of Argentina 7-5, 6-2 in the final. At the Grade A Osaka Mayor's Cup in Japan, won by Mmoh two years ago and Fritz last year, Casper Ruud of Norway and Mai Hontama of Japan won the singles titles. The boys and girls draws played out very differently, with the top four seeds reaching the boys semifinals, and two qualifiers, both from Japan, reaching the girls semifinals. The 16-year-old Ruud, the No. 3 seed, defeated No. 2 seed Yunseong Chung of Korea 4-6, 7-5, 6-3 in the semifinals and beat No. 4 seed Mate Valkusz of Hungary 6-4, 6-0 in the final. Valkusz had advanced to the final when top seed Seong Chan Hong of Korea retired trailing 5-3 in the semifinals. Top seed Katie Swan of Great Britain lost in the quarterfinals to qualifier Xinyu Gao of China. Gao was beaten by the unseeded Hontama in the semifinals, while 14-year-old qualifier Yuki Naito of Japan took out No. 11 seed Berfu Cengiz of Turkey. 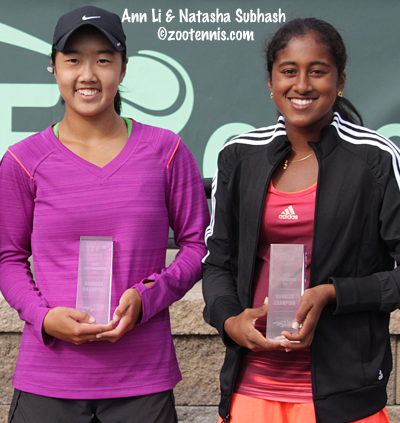 Naito's run came to end against the 16-year-old Hontama, who posted a 6-1, 7-5 victory in the final. The two US girls in the draw, Raquel Pedraza and Emma Higuchi, both lost in the second round. The girls doubles title also went to the home country, with unseeded Haruna Arakawa and Ayumi Miyamoto defeating top seed Dayana Yastremska of Ukraine and Wushuang Zheng of China 6-4, 6-4 in the final. Taiwan's Chien Hsun Lo and Japan's Yosuke Watanuki, the No. 4 seeds, beat unseeded Masamichi Imamura and Yuki Mochiduki of Japan 7-6(6), 6-1 in the final. 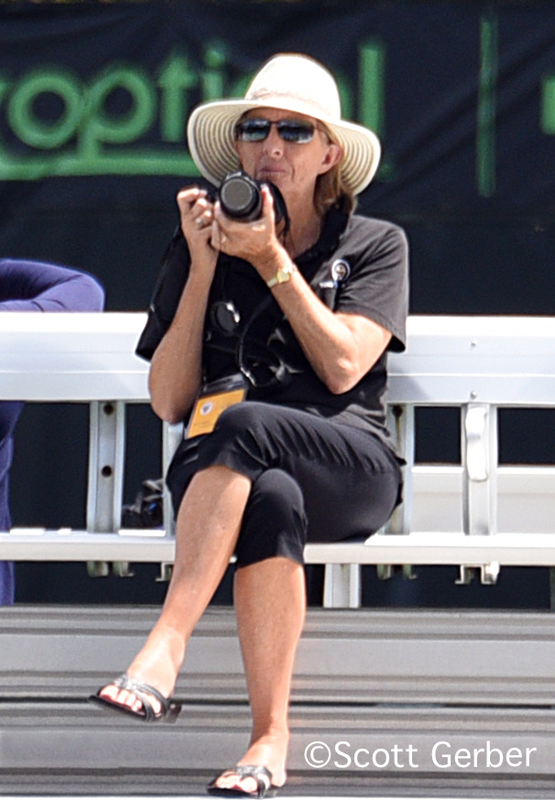 For more on the tournament, including the great crowds, see this ITF Junior website article from Sandra Harwitt, who also provides insight into Ruud's background, training, and Davis Cup participation. Brandon Holt and Kayla Day will return to Southern California with ITF crystal after claiming three titles Saturday at the Grade B1 Pan American Closed. 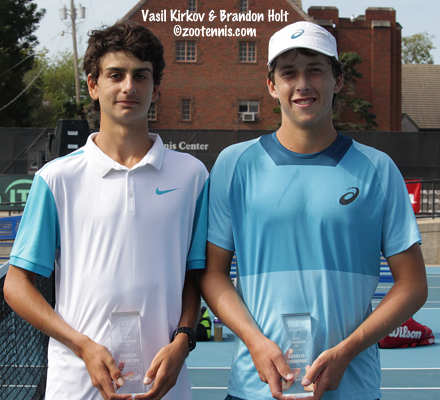 Holt, a wild card, won both the singles and doubles championship, defeating JJ Wolf 6-1, 6-7(5), 6-0 for his first ITF title, then partnering Vasil Kirkov to take the tournament’s last match, the boys doubles final. Day, the No. 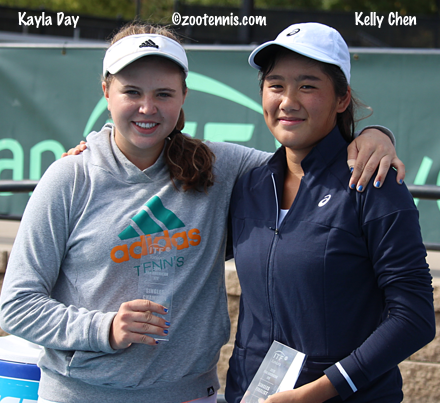 2 seed, defeated roommate and friend Kelly Chen 6-4, 6-1 to collect her first ITF Grade 1 title, with the girls doubles championship going to Ann Li and Natasha Subhash on a cloudy and cool morning at the Michael D. Case Tennis Center on the campus of the University of Tulsa. Holt won the first five games of the match against the unseeded Wolf, but the score was deceiving, with Holt needing to save break points in each of his first two service games. Wolf was making errors and Holt was avoiding them, but that changed in the second set, despite Wolf going down 2-0 to start. Breaking back to go up 2-2, Wolf then took his first lead of the match, holding serve for 3-2 from 15-40 down. Holt, who is the picture of composure most of the time, berated himself briefly, then held and broke to take a 5-3 lead. With Wolf making more forehands and hitting with more pace, the points offered high quality entertainment, and Wolf held to force Holt to serve for the match. Holt didn’t get to match point, with Wolf forcing two errors from 30-all, but he got another chance when Wolf was broken at 5-all. Again Holt couldn’t close, and he was broken in one of the quickest games of the match to send the set to a tiebreaker. Wolf played well to earn a 6-2 lead, but Holt won three straight points to put the pressure back on Wolf. Wolf delivered with a third-shot backhand winner, but if Holt was frustrated by the momentum swing in the match, he didn’t show it. Holt thought back to a time when he might not have handled the situation well. Holt was able to find that first set form at the beginning of the third, and Wolf was not able to match that level, with the racquet claps and “good shot” compliments that both boys displayed earlier coming mostly from Wolf in the final set. Three match points came and went with Wolf serving at 0-5, but the fourth went Holt’s way, with Wolf’s backhand catching the tape and bouncing wide. Wolf was disappointed he could not get in front of Holt. Prior to the girls final, Day and Chen were instructed by USTA coach Erik Kortland to give each other a little space. Day and Chen had roomed together all week, had eaten breakfast together, had come to the courts together and warmed up together, but neither had any difficulty putting that aside for the final. Day, who had saved two match points in her 4-6, 6-3, 7-6(3) semifinal win over Abigail Desiatnikov, came out determined to play more aggressively in the final, and she took a 2-0 lead. The ninth-seeded Chen broke back and held, and Day stayed even, saving two break points for 3-3. Chen was broken at love in the next game, but Day gave the break right back. One more break, the fifth of the set came next, giving Day a chance to serve out the set, and she did, cranking an ace to take it. Day, a left-hander, said her serve was a bigger part of her success in the final than it had been in the semifinal. Chen was broken to start the second set, and she had difficulty winning points after losing that game, with Day playing consistent, confident tennis while waiting for unforced errors. Chen held in the fifth game, but Day did not give her any opportunities to work her way back into the match. Day was pleased that she could rebound from her long, tense semifinal win Friday afternoon. While Chen and Day have spent all week together, that ends today, with Chen heading to Florence, South Carolina for Sunday’s first round of qualifying for the $25,000 women’s Pro Circuit event there. 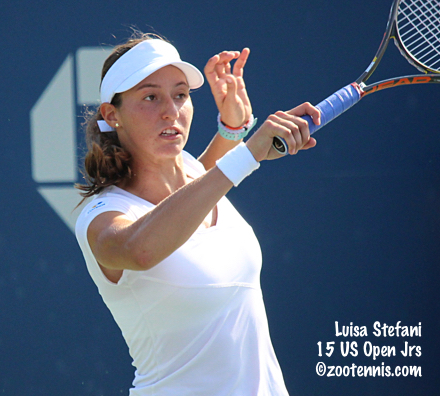 Day heads back home after a long stretch away from the West Coast, having returned from the Junior Fed Cup in Madrid as a silver medalist, then trained at the USTA Center in Boca Raton prior to traveling to Tulsa. The girls doubles final was a close one, with Li and Subhash taking it 7-6(4), 6-3 over Hurricane Tyra Black and Meibel Chi, who also were unseeded. There were a total of nine deciding points in the no-ad format, with Li and Subhash winning seven of them. Li and Subhash don’t claim to be particularly adept at deciding points, however. “It depends on how we’re feeling,” said Li, a 15-year-old from Devon, Pa. “It’s just who plays better on that point,” added Subhash a 14-year-old Fairfax, Va. resident. “So, yeah, it depends. Li and Subhash have had success together in other tournaments, so this result, the first Grade 1 title for either, is not a surprise. “We have fun out there and communicate really well,” said Li. “We know each other’s games.” “We’re really good friends too,” Subhash added. The boys doubles final was even closer, with the unseeded Holt and Kirkov defeating No. 6 seeds Sebastian Arcila of Puerto Rico and Gerardo Penchyna Cardenas of Mexico 6-4, 2-6, 10-8. Holds of serve were rare, with only five in the first set and two in the second set. That theme extended into the match tiebreaker, with half of the points going to the returner. Holt and Kirkov went up 7-4, but lost four points in a row. Holt then won both his points on serve, with a backhand volley winner making it 8-8 and an ace getting his team to match point. Arcila missed his first serve and he couldn’t handle the return of the second, with his backhand hitting the net cord to end the match. Holt was impressed with Arcila and Penchyna. By winning both singles and doubles titles this week, Holt’s ITF junior ranking will rise dramatically, but other than its role in entry into tournaments, he isn’t too concerned about that number. “I don’t know much about rankings,” said Holt, who will be heading back to classes at Palos Verdes High next week. “I don’t know how many points I’m getting for this or anything, but I’m not really worried about my ranking. It obviously affects seeding and stuff, but that didn’t affect me here." Complete draws can be found at the ITF junior website. For four days, No. 2 seed Kayla Day methodically took out her opponents at the ITF Grade B1 Pan American Closed. 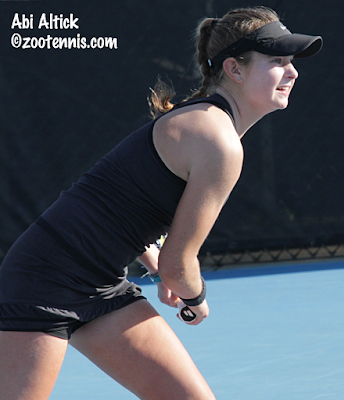 The weather changed overnight and along with cooler temperatures, drama was also in the air for the 16-year-old from Santa Barbara, California, who saved two match points to defeat unseeded Abigail Desiatnikov 4-6, 6-3, 7-6(3) to advance to Saturday's final. Down 3-0 with Desiatnikov serving in the final set, Day won the next three games, only to be broken in the next game, giving the unseeded 14-year-old a 4-3 lead. "I decided at 3-all just to start going for more," said Day, who felt her mental and physical energy drop at the start of the third set. "I was playing too tentative. At 4-3, she played a pretty good game, a better game than I did." With Kay serving at 3-5, Desiatnikov had two match points. She missed the first on a netted forehand early in the point, but the second, which ended with another Desiatnikov forehand error, came after a long rally, with Day refusing to flinch. "I got a little bit lucky," said the left-hander. "I just rallied and she missed on those." Prior to serving for the match at 5-4, Desiatnikov took a medical timeout, with the trainer working on her lower back. In obvious pain when play resumed, Desiatnikov went down 15-40. She saved one break point with a forehand winner, but Day hit a forehand return winner at 30-40 to even the match. Both players held, the only back-to-back holds of the set, for the deciding tiebreaker. Desiatnikov had already claimed her second round win over No. 5 seed Jade Lewis of New Zealand by taking a third set tiebreaker, but she was not up to the task this time, with several unforced errors giving Kay a 5-2 lead. A good first serve made it 6-2, and although Day netted a forehand on her first match point, she converted the second with a forehand forcing an error from Desiatnikov. "I was just solid in the tiebreaker and she was, I think, just tight," said Day, who showed little emotion throughout the nearly three-hour match, but did voice a loud c'mon at its completion. "She missed some easy balls that she wasn't missing before. I went for two forehands and it worked out." Day's opponent in Saturday's final is No. 9 seed Kelly Chen, who defeated No. 12 seed Abi Altick 6-2, 6-3. Chen has yet to lose more than four games in any set this week, but the 16-year-old from Cerritos, California said her win over Altick was a difficult one. "I'm working on my volleys and trying to be more aggressive on the court," said Chen, who has trained at the USTA's Boca Raton Center the past three weeks. "So that's how I've tried to play here. She played very well today, and I was a bit defensive. I felt she was taking control of most points, but I thought I handled it well. My defense was pretty good so I stayed in there most of the time." With her goal for next year set on playing the junior slams, Chen realizes her performance here can go a long way to achieving that. "I'm pretty excited," Chen said. "It's my first Grade 1 final. I've worked pretty hard the past few weeks and I'm ready to do my best in the final." The boys final will feature two unseeded players, with Brandon Holt and JJ Wolf both dismissing seeds in straight sets. 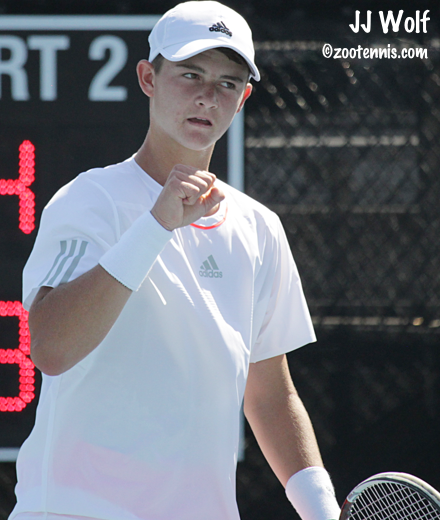 Holt has played only four ITF Junior events in his career, and the bulk of the points that make up his ranking of 714 come from his recent US Open Junior Championships doubles final. But in his 6-0, 6-1 dismantling of top seed and 83rd-ranked Benjamin Sigouin of Canada in Friday's semifinals, Holt proved his ranking doesn't reflect the level of his game. "I've haven't played many ITF tournaments, so I don't think I should be seeded or anything," said the 17-year-old University of Southern California recruit. "My ranking's like 700 or something. But I feel really comfortable playing with any of the kids out here. I've been working hard and playing well recently and I've been using my wild cards pretty well." 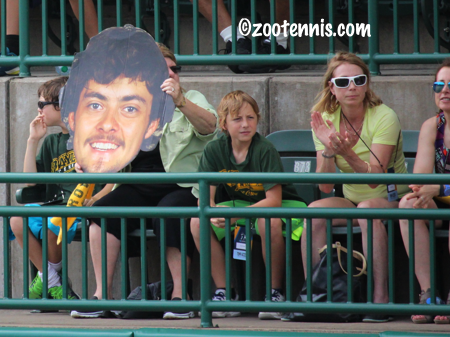 Holt, who reached the US Open Junior doubles final as a wild card, and won a Futures doubles title (both with Riley Smith) as a wild card, is also a wild card in this tournament, but a spectator would have had suspected he was the No. 1 seed, not Sigouin. Although he had not lost a set in the tournament until today, Sigouin was unable to find the court in the first set, and he was down 3-0 in the second set before he won a game. "He plays really aggressive and takes a lot of chances," said Holt. "He is bound to make a few more errors, but he has a lot of upside too if he's playing well." But getting any feel in a match when your opponent is off can be tricky as well, which Holt acknowledged. "It was tough for me to get a rhythm for sure," said Holt. "Definitely in the beginning he was making a lot of errors, so I was just trying to make balls. That's not normally my game, I like to play aggressive, and so by the time he started getting his energy a little bit in the second set, it was tough for me to play well, especially to close out the match at the end. I wasn't really feeling I could really hit the ball offensively because the whole match I was just making the ball in, making him play. So it was hard to change that, but I played well." Although the first set of JJ Wolf's 6-1, 7-5 win over No. 7 seed Zeke Clark could have been mistaken for a set in the Holt-Sigouin match, Wolf knew better. "He's never going to give up," said Wolf, who won the first four games of the match. "He's the biggest fighter probably in junior tennis right now, so I was lucky to pull that match out." In the second set, Wolf led 4-2 and had two break points with Clark serving at 15-40. But to the delight of several dozen local supporters, the 17-year-old Tulsa resident won the next four points and broke Wolf in the next game for 4-4. After holding for 5-4, Clark had a set point at 30-40, but netted a forehand, and Wolf went on to hold. "That's a shot that he doesn't miss, it never happens," said Wolf, a 16-year-old from Cincinnati. "It was just unlucky. There's so much wind out here, whenever you get a high ball it just floats around, so it was a tough shot." Clark was broken in the next game, missing an overhead on a good lob from Wolf, and Wolf reached his first Grade 1 final by holding to 15 in the final game. Wolf and Holt haven't played before, but Wolf has seen Holt's results this week. "He has really good timing, hits the ball solid every time," said Wolf, who like Holt, was a sportsmanship award winner this year in Kalamazoo. "I haven't gotten to watch him play much, but he's a great competitor also. He's been taking it to some people this tournament, so I'll be ready to fight." Holt will also be playing in the doubles final, after he and Vasil Kirkov, who are unseeded, defeated No. 3 seeds Trent Bryde and Patrick Kypson 7-5, 6-3. After the boys singles match on Saturday morning, Holt and Kirkov will face No. 6 seeds Sebastian Arcila of Puerto Rico and Gerardo Penchyna Cardenas of Mexico for the doubles title. Arcila and Penchyna beat unseeded Lane Leschly and Max Mendelsohn 7-6(4), 6-3. The girls doubles final will feature two unseeded teams, with Hurricane Tyra Black and Meible Chi facing Ann Li and Natasha Subhash. Black and Chi took out No. 3 seeds Morgan Coppoc and Maria Mateas 6-4, 7-5, while Li and Subhash defeated the unseeded team of Elysia Bolton and Clarissa Hand 6-2, 3-6, 10-8, winning six of the last eight points after trailing 6-4 in the match tiebreaker. The boys singles final and the girls doubles final are scheduled for 9 a.m. Central time Saturday morning, with the girls singles to follow the doubles and the boys doubles to follow the singles. 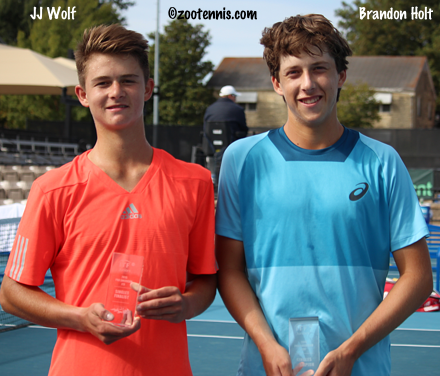 JJ Wolf is not concerned about his ranking or his standing against more experienced ITF Junior competitors. The unseeded 16-year-old from Cincinnati is determined instead to "have fun," and this week at the ITF Grade B1 Pan American Closed, that mindset has led to four straight-set wins, including Thursday's 6-4, 6-1 defeat of No. 2 seed Jack Lin of Canada. With temperatures over 90 degrees and no clouds to provide any relief, Wolf had to be pleased about minimizing his time on court. The match may have turned on two games in the first set, when Wolf held from 0-40 down at 2-3, then broke Lin in the next game. Wolf then broke the 16-year-old right-hander twice to take a 3-0 lead in the second set, and although Lin got one of the breaks back, he could not overcome the combination of power and defense that Wolf exhibited. "He's a super hard competitor, solid everywhere and he has a really good serve for his size," said Wolf, who will be playing in his first ITF Grade 1 semifinal on Friday. "He hit his spots well. These matches, if you look at the stats, I might have won five more points than him this match. The score was not as close in the second but all the games were close." Wolf has made some changes to his serve, which he mentioned as a key to his success this week. "I'm hitting it a little harder now," said Wolf. "I'm not making it very much, but I'm just trying to have fun." After qualifying at the US Open Junior Championships and winning his first round match, Wolf proved he could compete with the top juniors, but that is not his focus. "I think that gave me a little bit of self-assurance, that if I play my game, maybe I can play with some of these kids," Wolf said. "But I don't think too much about how good the other guy is if I'm having fun and playing the right way for the future." Wolf will play No. 7 seed Zeke Clark, who defeated No. 16 seed Nathan Perrone 6-2, 6-2. Clark, who had lost to Perrone at last year's Orange Bowl, said he is very comfortable on the Michael D. Case Tennis Center courts, with the 17-year-old Tulsa resident already having played this tournament five times. Wild card Brandon Holt continued his run this week, defeating unseeded John McNally 6-2, 6-4. Down 0-40 serving at 4-3 in the second set, Holt won five straight points to keep his lead and closed out McNally two games later with a forehand volley winner. The 17-year-old from Rolling Hills, California will face top seed Benjamin Sigouin of Canada, who beat unseeded Oliver Crawford 6-3, 6-4. All four of the boys semifinalists have not dropped a set in their first four wins this week. That is not true of girls No. 12 seed Abi Altick, who has had two grueling three-set matches, particularly in yesterday's third round and then again today. After dropping the first set 6-0 to unseeded Meibel Chi, Altick didn't look as if she would be spending much time on the court Thursday. But as quickly as Chi took the first set, Altick took the second, and went up 5-0 in the third before closing out a 0-6, 6-1, 6-3 win. "She came out playing really well," said the 17-year-old from Louisiana, who needed three hours and 27 minutes to defeat No. 7 seed Sofia Sewing on Wednesday. "Her serve was really on and she has a really good forehand, which she wasn't missing much. In the second set, I sort of changed my mindset. I started going for more and being more aggressive because it just wasn't working, not at all." Altick said her slow start was also a result of the previous day's marathon. "It took a while to warm up," Altick said. "I'm still a little sore, but I'm taking ibuprofen, so that's helping." Up 5-0 in the third, Altick had two match points with Chi serving, but Chi got on the board and broke Altick for 5-2. Chi saved another match point in her nextvservice game, but she held and Altick had another chance to serve it out. Chi made too many unforced errors to pressure Altick in the final game, with Altick going up 40-0 and converting her fourth match point when a Chi backhand went long. "I was really on a roll, but I started getting a little nervous," said Altick, who trains in Boca Raton, Florida. "She really went after her forehand in those last couple of games, so I just tried to get it to the backhand. I still thought I was going to win, that I could do it, but yeah, I was relieved." Altick will face No. 9 seed Kelly Chen in the first ITF Grade 1 final for both, after Chen ended qualifier Ashley Lahey's run with a 6-1, 6-4 quarterfinal win. No. 2 seed Kayla Day, a quarterfinalist here last year, reached her first Grade 1 semifinal with a 6-2, 6-3 win over No. 6 seed Kylie McKenzie. Day and Chen have both reached the semifinals without dropping a set, while Day's next opponent, 14-year-old Abigail Desiatnikov, has had her share of tough matches. In the quarterfinals today, the unseeded Desiatnikov managed to get through in straight sets after two long three-setters the previous two days, beating No. 13 seed Morgan Coppoc 6-4, 7-6(3), but it will be interesting to see if the many more hours spent on court compared to Day will have an impact in their semifinal Friday. The doubles semifinals are set, with only one seeded team remaining in the girls draw. Top seeds Usue Arconada and McKenzie lost to unseeded Chi and Hurricane Tyra Black 2-6, 7-5, 10-8, and No. 5 seeds Carson Branstine and Taylor Johnson were defeated by unseeded Elysia Bolton and Clarissa Hand 7-5, 6-4. Bolton and Hand will meet unseeded Natasha Subhash and Ann Li, who defeated No. 8 seeds Madison Battaglia and Hanna Chang 6-1 ,7-5, while Chi and Black play No. 3 seeds Coppoc and Maria Mateas. Coppoc and Mateas defeated unseeded Mimi Levine and Layne Sleeth of Canada 6-4, 6-3, their third consecutive straight-set win. Two seeded teams remain in the boys final four. No. 3 seeds Trent Bryde and Patrick Kypson won a contentious match against unseeded Robert Hammond and Sebastian Mermersky 3-6, 6-2, 10-4 and will face unseeded Vasil Kirkov and Holt, the only player still remaining in both singles and doubles, in the semifinals. Kirkov and Holt beat unseeded Fernando Ramirez Lascurain of Mexico and Christopher Vleeming Ortiz of Guatemala 6-1, 7-6(2). No. 6 seeds Sebastian Arcila of Puerto Rico and Gerardo Penchyna Cardenas of Mexico defeated Keenan Mayo and Danny Thomas 6-3, 6-2 to advance to a meeting with unseeded Lane Leschly and Max Mendelsohn. Leschly and Medelsohn won their third consecutive straight-set match Thursday, beating unseeded John Jorgeson and Jakub Wojcik 6-3, 6-0. Play will begin at 9:30 am Central Time on Friday, with Holt and Sigouin in singles and the girls doubles semifinals. The three other singles are to follow, not before 11, with the boys doubles semifinals after the singles, not before noon. Complete draws can be found at the ITF Junior website, where there is also coverage of this week's Grade A Osaka Cup in Japan.